I have always felt that after wars the largest statue should be erected to the Unknown Civilian. Heavy dreams all night, because of the diet-change no doubt. Can't remember any of them, except reading an obituary of Stephen Fry and marveling how little money he had made. Improbable. The human brain is a stinking swamp which burps bubbles of dreamlets like marsh-gas during the night. . . Women are all falsche Fünfziger in the long run. Men in the Northern Hemisphere: upright, honest, decent and true. I just wanted to say thankyou for what you do Mr Irving, you are a huge inspiration to me. I will be purchasing all your books over the coming months, though I'm quite broke at the moment so I'll be quite slow, I'm always true to my word though. You opened me up to the other side of history, so refreshing. Keep up the good work. I wonder what's going on here. I have received about twenty such commendations in the last ten days. Have I died and nobody told me? Has there been an obituary somewhere? J. REPLIES: "I have gotten similar messages through the Contact Us form or ones that people leave as notes attached to their book orders. No idea why the uptick in commendations, though." I HAVE suggested on my front page that people might like to proof read our new Goebbels book before we send it to press. It contains tiny scanning errors. We had it scanned in India. People at once begin knocking at my door, figuratively speaking. That's nice. But how many will see this task through to the end? It ain't easy. Post scriptum: Would that you produce another few books. Your books so far have moved the world already. They have changed the way the world sees itself. And you have contributed as much or more than any man in the post war era to the righting of the ship of free civilization (sounds a bit poetic, but, nevertheless, true). Your books are so important, it's difficult to estimate their true worth. 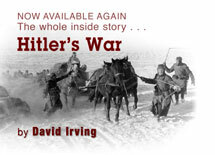 But Hitler's War and Churchill's War have without doubt demolished the status quo on post war understanding of the conflict and the two greatest personalities in the West at the Time, which has in turn led to a huge shift, as you have, yourself, experienced, in political measures to stop your snowball. In that sense, you are a victim of your own success. Do you think laws would have been brought in to silence speakers without your historical work grounded in the solidest erudition? You were only imprisoned because of the book you wrote thirty years earlier! I ask J. again whether I have died. Not at all sure about that now. She replies: "Got an email from a potential Amazon customer wanting to know if Hitler's War could be signed, as he saw another seller who is selling it with an autographed bookplate. I am wondering if I should warn him about the poor handling Lance Frickensmith gives to books." "Yes do," I respond. "Warn him that Lance's stock of my books is (a) stolen from us (b) all mouldy [from his damp warehouse]. I can sign your customer's when I come to DC." And I add, "And if it is Lance's it is not a bookplate, just a small address label of which I signed a sheet about five years ago, before I was imprisoned anyway." He has now ordered from us. THE big news today is that our government's erstwhile friend Colonel Muammar Ghaddafi has been captured and killed this morning, and the jackal yelping -- in German they would say johlen -- has begun. The Libyan government forces, none of whom seems from the television images to have been wearing the distinguishing military insignia or to have come under the kind of officer-command that International Law requires of regular armies (i.e., they were francs tireurs), found him "cowering" in a hole (ah, those fragrant memories of the end of Saddam Hussein); he was beaten up by the mob, and shot to death at close range with bullets in the forehead and stomach. It seems that French warplanes went in and strafed a road convoy outside Sirte. The photos show a bunch of totally wrecked and burned out civilian cars and the crisp remains of their passengers by the roadside. Whether or not the French had specific information on that convoy and "painted" it with targeting lasers, it seems hard to reconcile with the announced purpose of the Cameron-Sarkozy war as being to "protect Libyan civilians". I wonder if we will ever get a total of the Libyan civilians who did not live to profit from Cameron's juvenile interventionism? I have always felt that after wars the largest statue should be erected to the Unknown Civilian. Early news reports say that the 18-year-old urchin seen brandishing the colonel's own Gold-plated pistol was the hero who did it. (That wording is omitted from later reports.) It all smacks slightly of the end of the rather inconvenient Admiral Darlan in Algiers in December 1942, who was shot in the back of the head by a young Arab assassin, equipped with a gun provided by Britain's SOE and with dollars provided by the French General de Gaulle. The BBC minces around today's sanguinary event calling it "possibly an extra-judicial killing" -- pussyfooting words indeed, which it does not use in its next news item, about the trial for murder of a young and beautiful British girl in Bristol by a Dutch immigrant. I wonder how many people view these news reports with proper scepticism, and how many just lap them up as served? Needless to say, there follows a litany of charges against the now usefully dead "dictator" Ghaddafi, who can no longer testify in court about his relations with the British and other governments: the charges dished up against him include the bombing of the 1986 La Belle nightclub in Berlin, which -- as CIA director Bill Casey personally admitted to me when I challenged him in a conversation a few weeks later -- was demonstrably not Libyan-inspired, but used by the Americans (complete with forged telephone intercepts) as a public excuse to bomb Tripoli and kill one of the colonel's adopted daughters; the "downing" of flight Pan Am 101 at Lockerbie, where the actual Libyan involvement has always been murky to those of us who follow such cases (of the two men finally put on trial one was actually acquitted, the other has always protested his innocence); and Libya's now-abandoned nuclear research -- which never amounted to a row of beans anyway. For that matter, who are we to judge, in Britain and the USA, being the only countries ever to have used weapons of mass-destruction against civilians in war? People often overlook that. Dear Mr Irving I had no idea I'd be privileged to speak to you directly. Heavens, it's been years. I've been an in-background supporter way back when you could come to Melbourne, Australia, so many years ago and spoke at a hotel and university -- heavens how long ago is that -- I have two autographed books. My services are free, keep the money - call it a cry to truth in history. Yes, it is now clear, I have died somewhere and J. did not tell me. 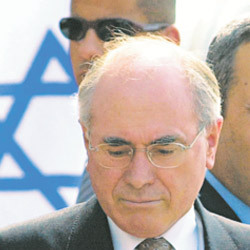 Of course Paul Keating and John Howard (right) have steadfastly banned me from Australia at the instance of their multi-billionaire Jewish lobby. I reply to him: "A pleasure on my part too, Dr A. Sorry I can't visit Australia any more. My fourth daughter is now an Australian, and lives in Brisbane with her husband and two children, and I can't visit any of them!" -- Ah, the great and fearless democracies!